Aminos, CLA and Green Coffee Amino-Charged Energy Drink Taurine · Caffeine · CLA · Green Coffee 4.2 g Amino Acids Sugar-Free and Only 5 Calories! Green Coffee Extract and C.L.A. Natural-Source Caffeine Dietary Supplement 30 Servings cGMP Certified Facility Gluten Free Lab Tested - Every Ingredient Purpose: Formulated to provide Energy, Focus and Diet Support in conjunction with a Sensible Diet, Exercise and / or Physical Activity. Energy To Train, Aminos To Maintain And Diet Support! AminoCuts could be the most delicious drink mix we've ever made. Perfect to enjoy anytime; easy-to-mix, full of Aminos and loaded with ingredients like natural-source Caffeine, Taurine, C.L.A. and Green Coffee extract - AminoCuts is simple. On your way to do some Cardio? Need a mid-afternoon "pick-me-up"? AminoCuts fits your life. Citric Acid, Natural and Artificial Flavors, Sucralose, Acesulfame Potassium, Calcium Silicate, FD&C Blue #1. Take 1 to 2 servings (7-14g) with 180 - 240mls of water per serving before Physical Activity, or anytime you need an Energy and Amino boost. 5.0 out of 5 starsAwesomely Yummy! I live this stuff! The piña colada flavor is tough to beat! Gives a great boost for workouts and lull times. It's my only pre I use now. Edit: I’ve been ordering the grape escape amino cuts off of amazon for at least a year now. It’s been great up until the last two orders. Something has changed in the recipe or with the company. At first I noticed the color became a lot darker but it still tasted great and had the same energy effects. Well after the color changing container was empty I order another to which also looked the same but had NO taste at all.. NO FLAVOR. Idk what’s going but i won’t be ordering this off amazon anymore and if it’s the same situation in store I wont be buying it anymore. 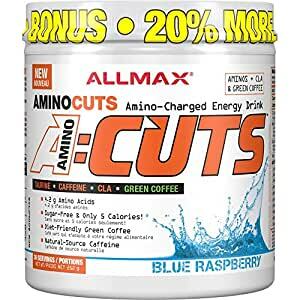 Let me start this by saying I absolutely love amino cuts. I have been using them for about 8 months now. I always order them on amazon and have had this flavor before. This time when I got this one it’s almost as if this batch wasn’t made correctly. It has an aweful taste to it like a rotten taste. I use this as my pre workout and I have now used it 4 times now. After I drink it a get a nauseous feeling. Not sure if it is related. 5.0 out of 5 starsJUST BUY IT. As a competitive bodybuilder, I’ve tried my fair share of BCAAs and AminoCuts has to be at the very top of my list 👌 The Watermelon flavour is solid, not too sweet, actually tastes authentic. I use this intra-training and the energy boost is clean + the added glutamine is such a benefit post-workout. This has become a staple in my stack, you won’t be disappointed.